Protests and rallies took place across the US and around the world on May 1st to commemorate International Workers Day. 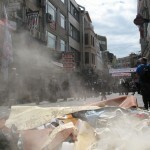 In Turkey, demonstrations erupted across the country after the government banned labor rallies in the center of Istanbul. Riot police fired tear gas, pressurized water and plastic bullets at demonstrators who came out to defy the ban. This, on the same day the Washington, D.C.-based Freedom House released its annual press freedom report, downgrading Turkey’s media from ‘partly free’ to ‘not free’ in the context of what critics say is rising authoritarianism in the country. 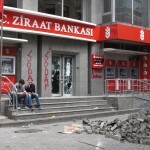 FSRN’s Jacob Resneck has more from Istanbul. In Turkey, demonstrations erupted across the country on May Day after the government banned labor rallies in the center of Istanbul. riot police fired tear gas, pressurized water and plastic bullets at demonstrators who tried to defy the ban. This comes the same day the Washington DC-based watchdog group Freedom House released its annual press freedom report, downgrading Turkey’s media from ‘partly free’ to ‘not free’ in the face of what critics say is rising authoritarianism in the country. The popping sound of tear gas canisters and plastic pellets being fired and the retort of firecrackers from protesters has become a familiar sound in Turkey. Early Thursday, May 1, masked demonstrators retaliated with slingshots and rocks as riot police tried to block their entrance to Taksim Square. The melees brought the city of Istanbul to a standstill and there were similar clashes in the capital Ankara and the coastal city of Izmir. By midday shopkeepers were beginning to clean up, sweeping spent gas canisters and fireworks tubes into the gutter in the Besiktas district adjacent to Taksim square – the site of a 1977 massacre by rooftop snipers against leftist demonstrators that remains one of the greatest unsolved killings in the history of the Turkish republic. The square is also home to Gezi park, which thousands occupied last year to block its demolition for development. Ahmet Karakurd, a 47-year-old clerk at a shoe store stood in front of the shop to protect it from damage. He was dismayed by the wanton destruction by demonstrators who had been clashing with police as they tried to fight their way to Taksim but were pinned down. “We are just waiting here to protect the shops. Take a look, at that side over there, they smashed shop windows. It was during these events they were destroyed,” he said. But others say it’s the government’s attempt to stamp out street demonstrations that’s provoked the violence. May Day – which is Labor Day in Europe – went off peacefully in 2010, 2011 and 2012 when the rallies on Taksim Square were sanctioned. Last year the government announced a ban on demonstrations and there were similar clashes with police intent on blocking access to the square. With access to Taksim blocked, small groups of youths armed with slingshots and rocks taunted riot police in what became a destructive game of cat-and-mouse fought on side streets. Others were breathless and coughing from the effects of the gas that hovered over the district. As the police and protesters fight running street battles, Freedom House, an international rights group, has downgraded Turkey’s media from ‘partly free’ to ‘not free’ in yet another sign that authoritarianism is rising. Human rights groups have also been extremely critical of Turkey, especially against deadly police crackdowns on peaceful demonstrations which are guaranteed by Turkey’s constitution but flouted by government leaders. A group of young professionals filming events on their cell phones told FSRN that the government’s recent ban on YouTube and Twitter is indicative of its effort to clamp down on society — but it won’t work. 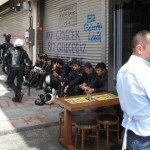 Despite the clashes people still managed to enjoy themselves around the Besiktas district. There was singing, dancing and even beer drinking on what is, after all, a national holiday and meant to be relaxing. The government has thus far given no indication they intend to sanction similar celebrations in the future.